Here at Aquaflow we pride ourselves on our 34 strong vehicle fleet and strive to achieve the maximum safety for other road users and our drivers, especially in and around London. So, when we looked into gaining FORS accreditation, we found a perfect way to achieve, improve and maintain driver and vehicle standards. All our drivers have attended a one day Cycle Safety Awareness Course and have completed further on-line FORS driver training. We quickly achieved Bronze standard, then progressed to Silver back in December last year. We are now striving to achieve the top level of Gold and through progressive training we aim to maintain our standards, increase safety to other road users and improve our fuel efficiency which will in turn reduce our carbon footprint. AquaFlow recently undertook some works for Abbey Court School, which is a school for students with profound and multiple learning disabilities. As we were so touched by the efforts of those on site to provide their students with the best possible start in their lives, we made a small donation by means of some Noodles for the hydro therapy pool for the children to play with and to assist with their learning. 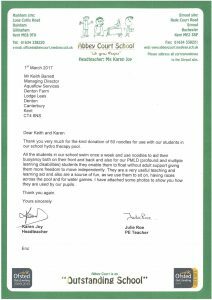 We received the most wonderful, unexpected letter of thanks back and some pictures of the children enjoying themselves, which was extremely rewarding for us all.